My Life at Pansy Cottage and Garden: Exhibiting in Las Vegas! I'm at the Las Vegas Market and having a wonderful time. 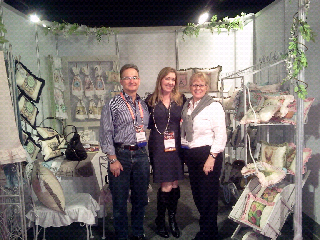 Here I am in my booth and also with my customers from Australia! The Heavenly Hostess, Cynthia Wadell is here too. Her line is gorgeous. This is so exciting to see how the show works - thank you for sharing and taking us along with you. 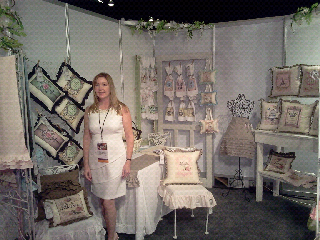 Sharon, your booth is beautiful! I wish I could be there to see it in person! Congrats to you, lovely lady!! Oh, and I will be looking for the new apron-ology to hit the stands. Cannot wait to get to see your apron!! Your year is starting off great! Good luck at the show. We just got back from NYC. I hear the Vegas is getting bigger and better. 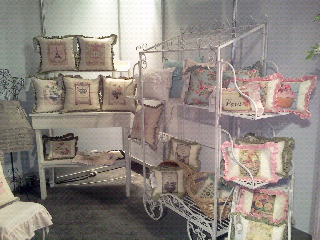 Gorgeous booth Sharon! Your pillows look wonderful...best of luck!